Several shark attacks occurred recently in North Carolina. While definitely scary, should the average person worry about getting attacked by a shark? People often contemplate risks like these, but usually our thought process doesn’t reflect reality. We often focus on unlikely horrific scenarios rather than frequent mundane ones. As an example, let’s look at the risk of getting injured due to slipping in the shower. I might expect to take a shower every day, but I might expect to slip only once every 100 showers. I’ll call this a medium probability. What about the impact? If I slip, chances are I might catch myself or just get a bruise. The impact is very low. I would classify this risk as low priority. However, consider a healthy person around age 75. Both the probability of slipping (eg. less motor control) and the potential impact (eg. broken bones) increase. This risk has moved from a low priority to a high priority over a lifetime. Using this framework, we see that a mundane every-day task can still be very risky. The National Safety Council has calculated the probabilities of dying from different causes. Note that these figures are lifetime odds for the whole US. The odds a person might ultimately die in a motor vehicle crash are 1 in 110. The chance of dying from an air travel incident is 1 in 8,000. Yet we’re fascinated by and benchmark our fears with plane crashes. If we don’t acknowledge this framework or recognize that risks can change over time, we’ll be wasting resources trying to fix the wrong situations. We may have evolved to fight or flee from lions and tigers, but today exposure to stress or sitting too long might be a bigger risk. Many of the risks we face are mundane and repetitive while many of our worries are caused by unlikely (but media-fueled) disaster scenarios. Make sure that you are taking care of yourself and reducing those long-term every-day risks! 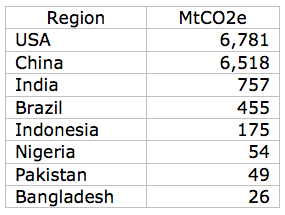 So there are three factors that we can simply multiply together to get total emissions for a region. Let’s look at each factor separately. Just these eight account for more than 50% of the world population. 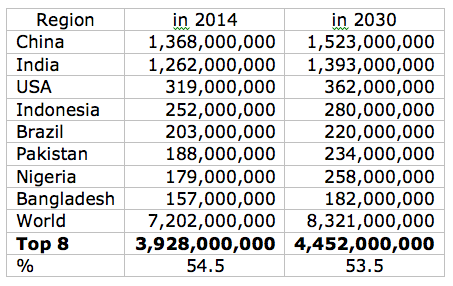 Note also that every one of these countries is expected to keep growing. The UN projects that the world will increase from 7,200,000,000 people in 2014 to around 10,000,000,000 within the next 80 years or so. Projections are notoriously uncertain, but most estimates expect population to grow. The eight most populous countries vary dramatically. 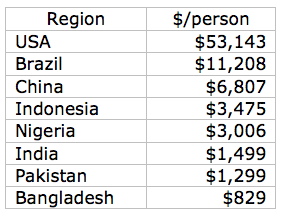 The average US person corresponds to 65 times the GDP of someone in Bangladesh. While GDP is not an indicator of well-being, it is a convenient way to estimate resource use. Affluence is trending upwards in all eight countries. Our current economic system is based on perpetual growth, which might be a fatal flaw. The last factor is a measure of how much useful work ($ GDP) we can get in exchange for something detrimental (kg of CO2e). 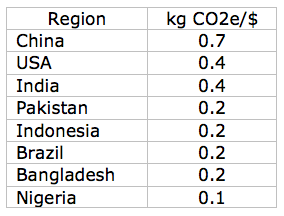 China has a notably high emissions per dollar rate, and that’s partly because they use so much coal. But think about it another way and they produce many of the wealthy countries’ products. This means that countries like the US that are actually demanding the products are responsible for at least some portion of the Chinese rate. Europeans seem to be more efficient than Americans, so there is room for the highest emitters to reduce their impact without impacting lifestyle. Furthermore, new technologies promise a gradual improvement in some sectors like electricity (from wind, solar, and nuclear). The units here are megatons of carbon dioxide equivalent, but don’t worry about that. We’re concerned more with which countries to watch in the future. Of course, to make better guesses, we should look at historical growth rates in each factor and we will in a later post. But these estimates show that the US and China are nearly neck-and-neck responsible for the lion’s share of emissions between them. Other countries (eg. India) might soon grow to match the top two, and a meta-region like the European Union certainly would rank if we combined the impacts of its member countries. This explains why some politicians in the US claim it’s useless to pass carbon legislation. Either China or the US (or the EU) acting alone to reduce emissions means failure. In the mean time, we can work on improving our energy use (reducing the technology factor) and by promoting family planning (reducing the population factor) especially in already wealthy countries.